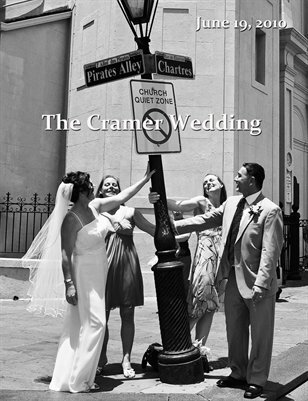 Destination wedding in the Jackson Square area of the French Quarter of New Orleans. Photos of their wedding ceremony and of the bride, groom, and attendants in various venues in the area are included. At one point a pirate arrived to welcome the visiting wedding party. The group visited St. Louis Cathedral, Pirate's Alley, artists along the fence of the square, and one bridesmaid fed a carrot to a carriage mule. At the end of the shoot, the ladies waded in the fountain in Jackson Square. What a fun and lovely day!